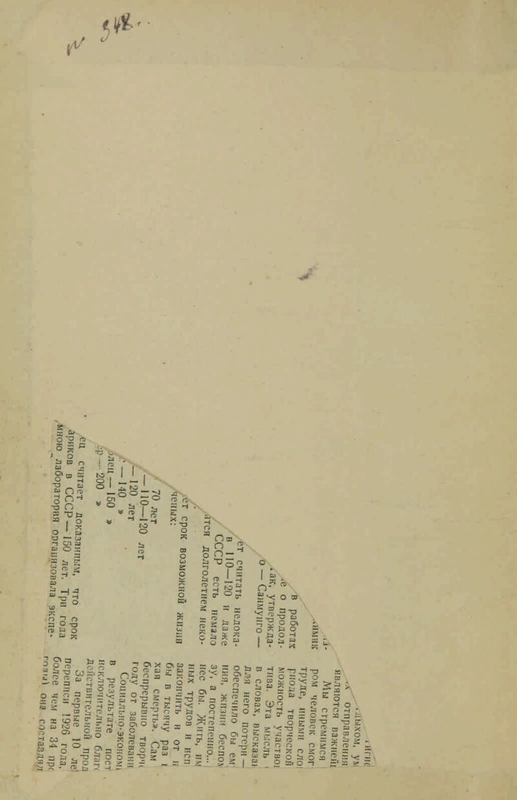 Subd: 1921-1922 Collection; 1923 No. 5 - Historical and Revolutionary Herald. Supervision: 1923 No. 5 - 1924 Society of former political convicts and exiled settlers; 1925 - All-Union society of political convicts and exiles-settlers. Ed . 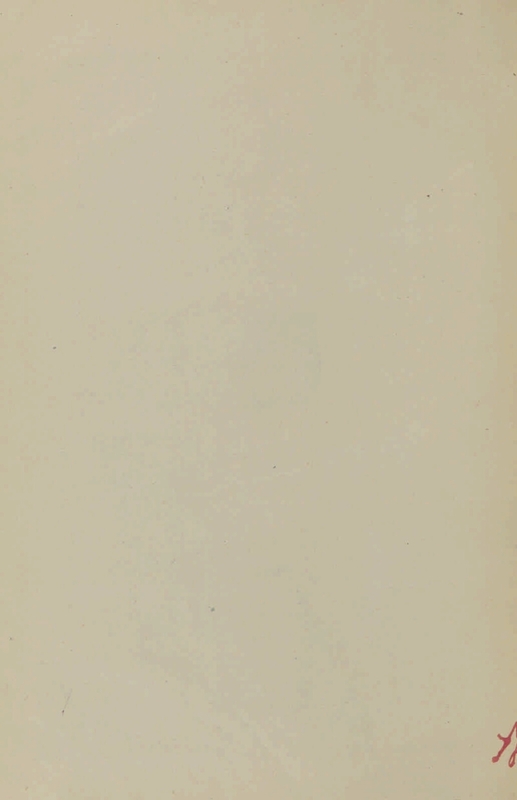 : 1921 - 1923 № 5 without an editor; 1923 № 6 - 1927 № 6 (book 35) under the general. Ed. Vl. 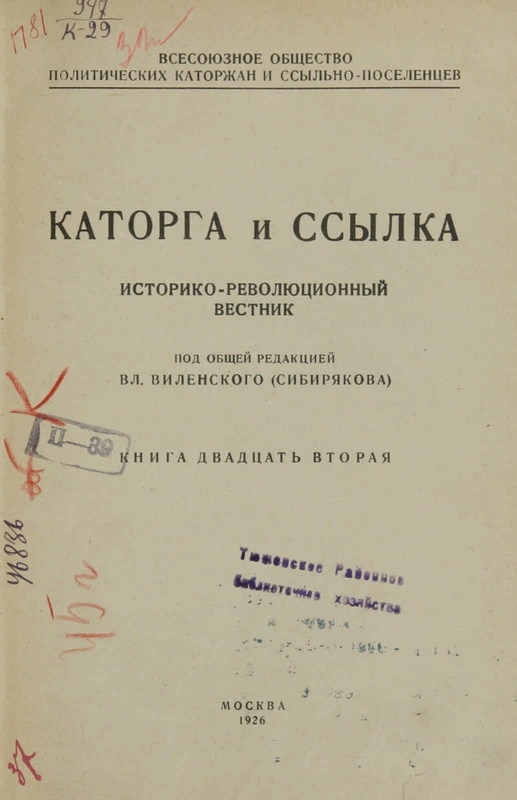 Vilensky (Sibiryakova); 1928 under the Society. Ed. F. Ya. Kohn; 1929-1935 under the Society. Ed. IA Teodorovich. 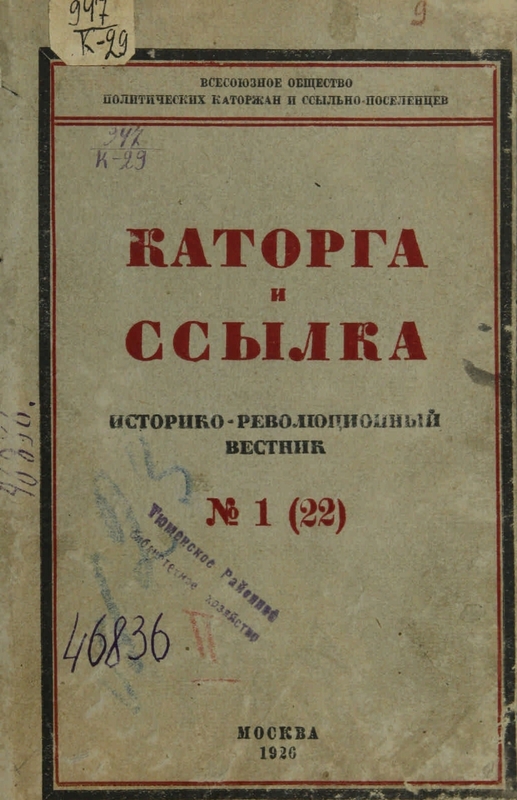 Publishing House: 1921-1922 Society of former political convicts and exiled settlers; 1923 № 6 - 1924 № 3 (book 10) without the indication of the publishing house; 1924 No. 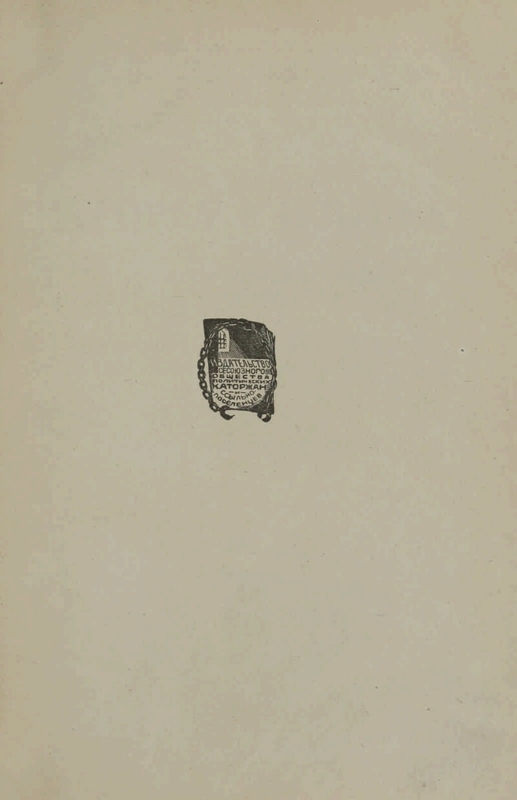 4 (book 11) - All-Union society of political convicts and exile settlers. In 1923, joined: Historical and revolutionary herald . I. Vilensky-Sibiryakov, Vladimir Dmitrievich (1888-1943). II. Kon, Felix Yakovlevich (1864-1941). III. Teodorovich, Ivan Adolfovich (1875-1937). IV. All-Union society of political convicts and exile settlers. Revolutionary movement - History - Russia - Periodicals. 2. Prison, penal servitude and exile - Russia - Periodicals. Content. departments: I. From the history of the revolutionary movement. II. Prison, penal servitude, exile and emigration. III. Faces of departed. IV. Bibliography. V. The Chronicle. Contained. articles: Perovskaya and the base of the circle of Tchaikovsky / AI Kornilova-Moroz. From my memoirs (To the article of AI Kornilova) / E. Kovalskaya. Chita in 1905 / I. V. Kholshchevnikov. Brothers Urzhumov / A. Charushin. Southern Military Technical Bureau under the Central Committee of the RSD-DPP / N. Rostov. PN Tkachev and populism / B. Kozmin. On the uprising of the Rostov Regiment in December 1905 / I. Ya. Shabrov. Peasants and landlords in the Polish Uprising of 1831 (Based on the materials of the Odessa Region Archive) / N. L. Rubinshtein. Little things of the past: 1). To P.Lavrov's article "The Socialist Movement in Russia" / R. Kantor. 2). P. A. Leburzhuy and S. G. Kropotkin in the matter of helping Russian exiles. 3). The Decembrist. Poem of the unknown. Informed N. Brodsky. From memories of female penal servitude / I. Kakhovskaya. According to the royal prisons (from the memoirs of the "professional revolutionary"). In Rostov and Novocherkassk, and other materials . 1. The people (the collection). 2. Domestic serials and continuing editions (collection). 3. Revolutionary movement - History - Russia - Periodicals. 4. Prison, penal servitude and exile - Russia - Periodicals.